A Transparency International (TI) study of 16 Asian countries, including India and Pakistan, has found that India has the highest bribery rate. 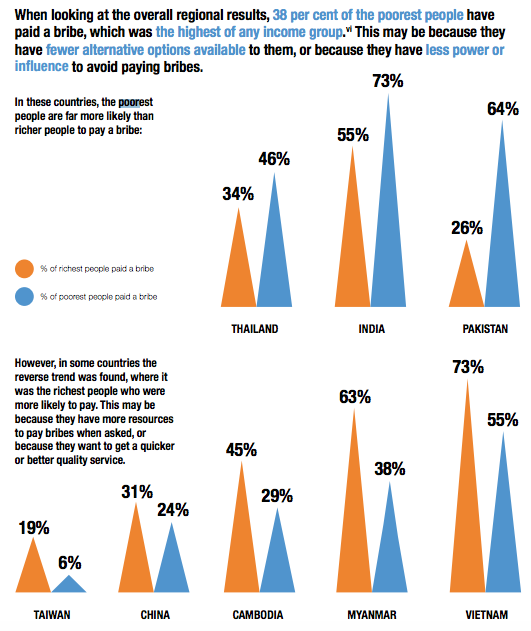 69% of survey respondents in India said they have paid a bribe, given a gift or done a favor to receive government services like education and health care. Vietnam follows with 65%, Thailand 41% and Pakistan 40%. China reported a much lower 26%. The Transparency International study released in March 2017 is part of a regional series for the Global Corruption Barometer. 22,000 people participated in the survey to answer questions about their recent experiences with corruption in 16 countries and territories in the Asia Pacific region. The study found that Japan has the lowest incidence of bribery at 0.2 per cent. South Korea and Australia recorded 3% each, Hong Kong 2% and Taiwan 6%. While 46% to 60% of Indians say they paid bribes for various public services, including in public schools and hospitals and for getting IDs, voter cards and permits and accessing utilities and the police, 31% to 45% said they paid bribes for court services as well. Unlike the rest of Asia, the poorest people are the biggest victims of corruption in India (73%), Pakistan (64%) and Thailand (46%). Pakistan fares worse than India in terms of bribes paid to police and courts but better in access to schools and health facilities. The TI report said that "police top the list of public services most often demanding a bribe. Just under a third of people who had come into contact with a police officer in the last 12 months said they paid a bribe. Overall, 38 per cent of the poorest people surveyed said they paid a bribe, which is the highest proportion of any income group". Although this report suggests Pakistan is doing better than its neighbor India, the corruption levels in Pakistan remain very high relative to more developed Asian economies. The worst part of it is that the poorest people who can least afford to pay bribes are the biggest victims of such corrupt practices. Fighting corruption requires a broad-based effort. The mass media need to play a role in exposing it; the lawyers and the judges need to do their part to address it. And the civil society at large needs to speak up whenever and wherever they see it. I am surprised at the understatement. I thought you were going to say India was the most corrupt country in the world, in addition to being the most divided country throughout history and the most racist country today, not just in South Asia but in the world as a whole. And not just now but throughout millennia. It must give you enormous satisfaction to say all of those things. Ahmad: "It must give you enormous satisfaction to say all of those things." I know it hurts you very personally and deeply to see anything negative about India. But I blog about the current news topics and the TI report is in the news right now. If you go beyond the headline and care to read what I wrote, you'll see that I am critical of corruption in Pakistan too and I suggest ways of dealing with it. But the ratio of being critical of India versus being critical of Pakistan is what counts. There are plenty of people criticizing India. It does not hurt me at all. I am not Indian. I really don't study India so I don't say much about it. Ahmad: "But the ratio of being critical of India versus being critical of Pakistan is what counts"
You and many others like you praise India and criticize Pakistan far more often at a bigger volume than I praise Pakistan and criticize India. I try my bit in my feeble attempt to balance the situation. TI corruption index which includes bribes shows India ranked at 79 and Pakistan at 132 - the worst in South Asia ! Something odd about this TI report. India is better than Pak in TI's annual CPI report , but worse than Pak in this report! Perhaps both, as they represent two different snapshots of reality! Hello sir, coming back after a long time. I just hope you approve my comments this time now. Riaz: "I know it hurts you very personally and deeply to see anything negative about India. But I blog about the current news topics and the TI report is in the news right now." I think his point is other way. You post the news & reports no problem but this report would never have been blogged if didn't show India Asia's most corrupt country. Nor anyone is going to get with it, India, Pakistan or Vietnam can't be more corrupt than Yemen, Syria, North Korea, Iraq or Afghanistan where government machinery is close to dysfunctional. China is an authoritarian Regime, doesn't public most crime reports or other things to world. So, most reports for China become irrevalen, only China knows that. This list is mainly centred towards bribery not major scams at high level corruption, that even on surveys. Surveys may only cover specific people who are frustrated or some specifc region. So, let's not compare. Plenty of other reports turn list upside down. Specially for China. MoA: "You post the news & reports no problem but this report would never have been blogged if didn't show India Asia's most corrupt country." You are wrong. Just click on some of the related links to see how often I have blogged about serious corruption in Pakistan. Riaz: "You are wrong. Just click on some of the related links to see how often I have blogged about serious corruption in Pakistan." May be, but that all about internal scams of Panama leaks etc..
You just criticized your government is normal in other countries including India too. All I'm saying that comparison isn't fair. One report puts India as most corrupt, other pushes us out of top 100. Many corruption cases are never known to world, so comparison isn't fair. And sorry for replying late.